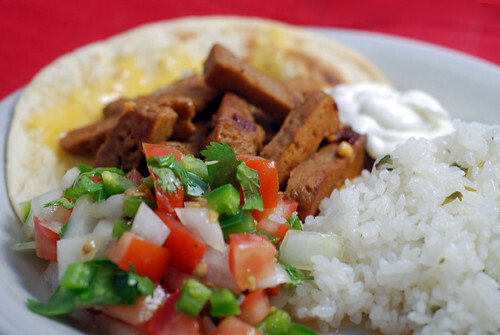 This entry was posted in Waste less recipes and tagged chewy, cooking, delicious, food waste, making seitan at home, recipe, seitan, stone soup, sustainability, sustainable living, tacos, vegetarian, wasted food, wheat gluten by Jean-François. Bookmark the permalink. I’m coming over for this dinner! Looks absolutely delicious. You’re always welcome (and I’m sure the cats would enjoy catching up); we’ll even remember to leave the cheese off of your taco. My kids have enjoyed the soy-based italian sausages with eggplant carbonata and soba noodles. We really aren’t missing the meat! Awesome post, Jean-François. We are also lovers of the taste and texture of meat, but then again, who isn’t? We are vegan now for the same reasons as you mentioned above – milk and eggs just being an extension to the same industry that started us off of meats. Hi Shannon, somehow this comment ended up in the spam filter – the first time that’s happened for a legitimate comment (and from a frequent poster at that). Wonder what set the filter off? Maybe all these references to “seitan” make it nervous. I was thinking of you when I posted, as it happened. Seitan is wheat protein (aka gluten) and has a really different texture than the soy based products I’ve tried (and fills that meaty void really well). It’s also oddly easy and fun to make (playing with goopy, elasticy things is high on my list of entertaining things to do in the kitchen) – something I can imagine you and your kids getting into. Wow! I am honored to get stuck in your spam filters. Maybe the WP gods are unhappy that I don’t eat spam anymore, their way of rubbing my nose in it. You’re on to something with the spam angle. I think it was Empedocles who first theorized that spam can neither be created nor destroyed … but it can be transformed. I suspect that that principle is what’s at work here. Looking forward to hearing about your sticky goop experiences. It does look good. 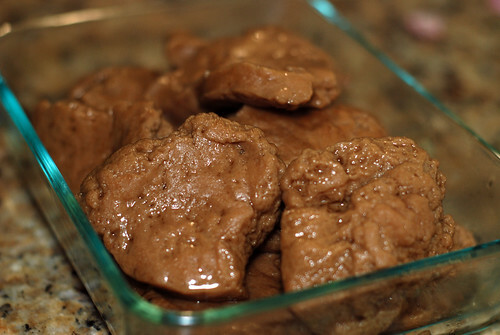 I do eat veggie patties shaped like hamburgers, but never heard of Seitan before. It’s basically wheat protein (a.k.a. gluten). It has a great chewy texture, and is porous so it absorbs flavors nicely. You should give it a try. Great, a new veggie meat-alternative to try making. Sort of a dense dumpling. Have you ever tried freezing it for storage? I am so intrigued by this! I gave up red meat 10 years ago but do eat chicken, turkey and seafood — though not every day. I hate preparing meat at home. Hate it. So I’m constantly searching for meat alternatives that doesn’t come in the form of a box of frozen processed soy-meat patties. Thanks for the recipe. If newly-vegan Shannon from Dirt N Kids doesn’t stop by to read this, hit her over the head with it in the form of a link posted on her blog. You can tell her I put you up to it. I’m sure she’ll stumble across it sooner or later – she always does. Definitely preferred this to any veggie burger I’ve had. For the tacos, I just sliced up a few cutlets, and marinated them in a little lime, oil and spices before pan frying them. Great additional tips — thank you! That looks incredibly tasty! Very much looking forward to the vegetarian collection! Well, I’ve cooked the meals, so now all I have to do is write it up – my weekend project for the next few weeks. The perfect thing to do in my wee hotel room. That rice looks so light and fluffy and perfect! We started using a rice cooker when we were in Japan (when in Rome…), which makes it really hard to mess up on the rice. Making seitan with regular flour is a pretty daunting task, but if you start with vital wheat gluten flour, it’s not so much trouble, and kind of fun. And by all means, feel free to share this or any other ideas you find here.